The Knicks rookie gets together with the NBA great as arranged by coach David Fizdale and treasures the advice he receives. TORONTO — The lessons on the court for Kevin Knox in his rookie season have been harsh at times. Most of them have been like Monday night, when he was part of another one-sided loss. A day after the Knicks snapped an eight-game losing streak with an unlikely finish, they were humiliated by a shorthanded Toronto squad, 128-92. The lesson Monday came one minute and five seconds into the second half when Knicks coach David Fizdale yanked all five starters after they gave up a 10-0 run to fall behind by 29. It was a much more pleasant lesson Sunday afternoon, as Knox got to talk with one of the greatest players in NBA history. After the Knicks beat the Lakers, he was heading out to meet his family with his bags in hand. He got a call from team security to report to Fizdale’s office, and he knew what that meant. It was the meeting that Fizdale had been trying to negotiate for much of the season, putting Knox in a conversation with LeBron James, Fizdale’s friend and a player he worked with for years as a Heat assistant coach. 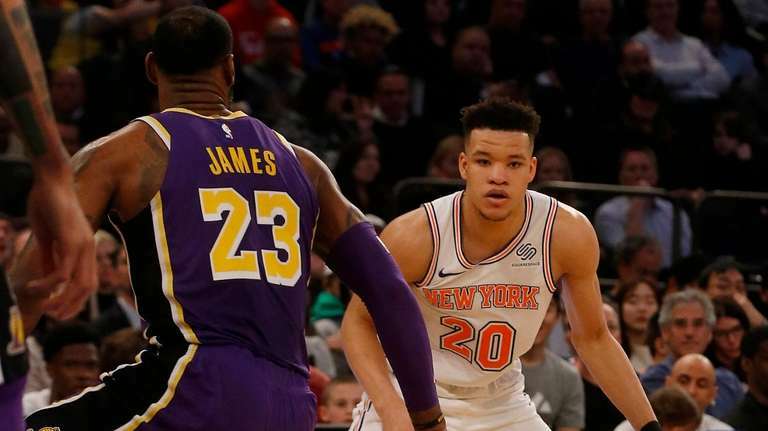 It might not have seemed like the best time for the meeting to occur, coming shortly after James had his potential game-winning runner blocked by Mario Hezonja with 2.3 seconds left in the Knicks’ 124-123 win. James shot 4-for-15 in the fourth quarter and the Knicks ran off a 13-1 burst in the final 3:45. Knox said he got some tips from James on what he needs to work on besides avoiding the critics on social media. Notes & quotes: The Raptors rested Kawhi Leonard, Serge Ibaka served the final game of his suspension and Kyle Lowry left in the third quarter with ankle soreness . . . Allonzo Trier had 22 points off the bench for the Knicks. Jeremy Lin had 20 points off the bench and Pascal Siakam added 19 to lead eight Raptors in double figures. Toronto scored 73 points in the first half . . . The Knicks (14-57), who have the worst record in the NBA, remained 2 1/2 games behind the Suns (17-55).